Earlier this week I posted about Egg and Banana Pancakes. It’s a simple recipe with only eggs and bananas. Since that post, I bought some almond meal/flour to add to the eggs and bananas. This evening I tried it. Mash eggs and banana with a fork. Add almond meal/flour and mix well. Add almond extract. Add Coconut Oil to griddle. Fill a ladle halfway for each pancake (makes 4-5). 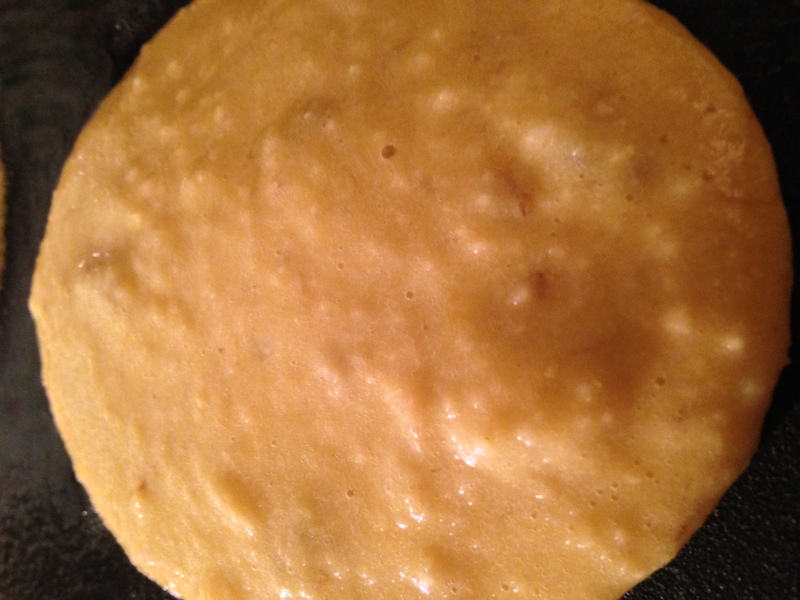 The pancakes looked golden and fluffy and bubbled up while cooking like they usually do the normal way. The first pancakes without the almond meal/flour tasted great. The ones with the almond meal/flour had a wonderful flavor but were a bit on the mealy side. Mealy, or grainy, like almonds are. That’s the second part of this almond, egg, and banana pancake story. What happened before I decided to try it out was a disaster in the kitchen with soup. How can you go wrong cooking soup? I’ll tell you how. Heat it up on the stove and forget that you have it on high. Carry on a conversation on your cellphone so that you get distracted. That’s how. I cooked the soup yesterday and was heating some on the stove. My husband called, but the noise I was making putting soup in the pot was making it difficult for him to hear me. I set the pot on the stove and walked out of the kitchen. A few minutes went by (not sure how many, but enough to cause smoke in the kitchen and charcoal-cooked soup. Somehow, soup didn’t seem very appetizing to me after that. The almond egg and banana pancakes didn’t taste too bad after all. Oh no! Burned soup. That would definitely make mealy pancakes more appetizing. I have only used almond meal in cookies. In that instance, it worked well. I enjoy reading about your kitchen experiments, and I appreciate your honesty. Now I’m not so sure about using almond meal/flour. If 1 cup is the same as 130-135 almonds, that’s a lot of protein! This is something I need to study more about before trying it in other recipes. Your thoughts? I think you can use it in the same volume for pancakes as you would regular flour. A lot of people use it in order to make their food contain fewer carbs. I’ve heard that you need to use more baking powder, and that it doesn’t work well in yeast type breads. A friend of mine who is gluten free uses a mixture of different flours and has recently begun to have a love affair wtih coconut flour. She told me she found a good pancake recipe and she likes the texture better than the ones with almond flour. Is the coconut flour easy to find?